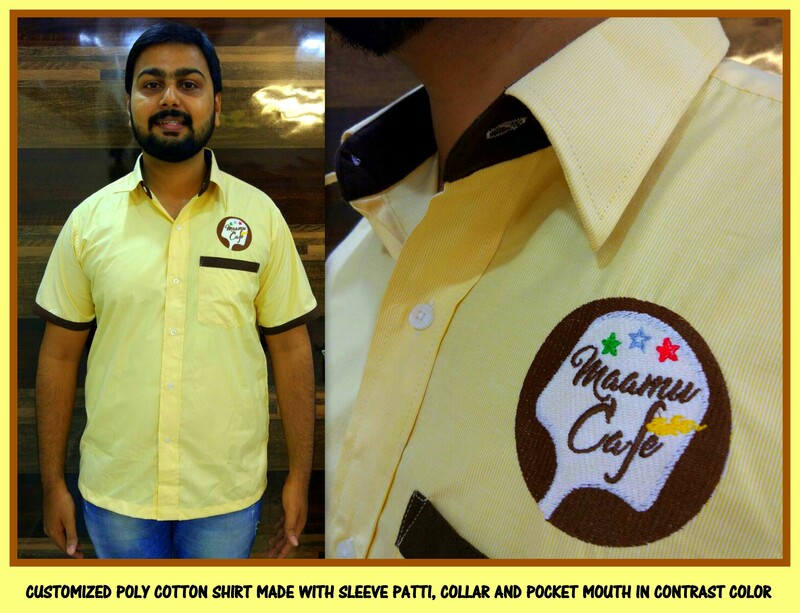 Here is a customized shirt made for Maamu Cafe. The shirt fabric chosen is one of the best blends of Poly Cotton fabric and the trouser fabric matching to this was of dark coffee color . We made use of the same fabric for little customization on Shirt. The logo embroidered was as per the brand logo and there was also a provision of pen hole given on the sleeve. Based on your requirement we can always work upon the uniforms provided ample time is provided to us as every customer has a specific requirement and achieving perfection always requires enough time. For your requirement of customized uniform shirts for your organization please feel free to call us now. We would be happy to assist you.